Listening to Mary Meeker present to the Web 2.0 conference last week, I was trying to figure out why I like her take on the web so much. Then it came to me: She’s driven by data, for sure–but unlike some analysts who just add up columns of numbers and report back “trends,” Meeker seems to genuinely like being a hands-on user of the space she covers. Listening to Mary Meeker present to the Web 2.0 conference last week, I was trying to figure out why I like her take on the web so much. Then it came to me: She’s driven by data, for sure–but unlike some analysts who just add up columns of numbers and report back “trends,” Meeker seems to genuinely like being a hands-on user of the space she covers. Last year, her numbers about the impending cross point between the fixed web (desktop) and the mobile web (everything else) were so compelling that they changed the way I saw the future. 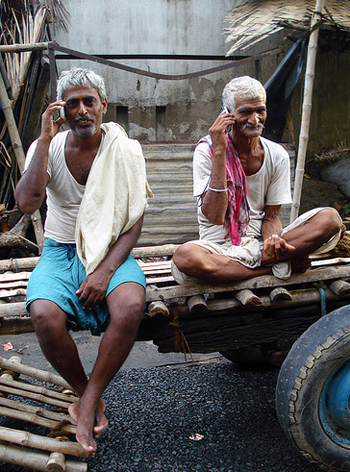 Mobile wasn’t “mobile” anymore, it was the web itself. Portable, with location awareness and ecommerce built in. So this year, I came to her presentation with some suspicion that she couldn’t have another year of big discoveries and new insights. The thing she nailed was just where the U.S. is on the world stage–knocking us down from our self-serving perch of being at the cutting edge. In fact, we’re lagging behind. Sure, Amazon, Apple, Facebook, and Google remain global leaders. But as Meeker points out, companies from China and Russia, like Baidu, Tencent, and Yandex, are fast becoming important. 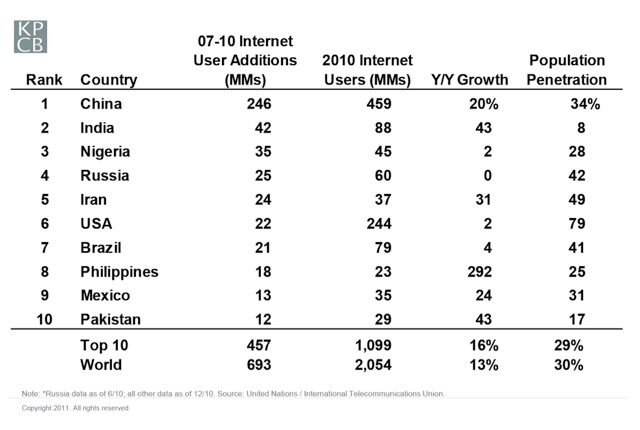 Eighty-one percent of users of the top global Internet properties are outside the U.S., says Meeker. In just three years, China added more Internet users than exist in the U.S. in total. And just where does the U.S. rank on the world stage? We’re not even in the top five. That’s China, India, Nigeria, Russia, and Iran. The U.S. comes in at number six, behind Iran. Well, if we don’t have the largest number of users on the web, we certainly must be one of the top users of social media online, right? Here too, Meeker provided some humbling data. 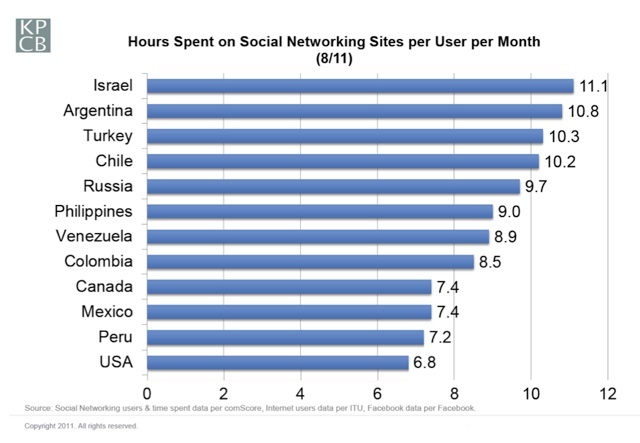 The U.S. comes in at number 12, behind a long list of countries who are more social media savvy than we are. Israel is number one, at 11.1 hours a month. Meeker says it seems that ranking here is based on a combination of large population of young people, and the addition of cold weather. As Meeker turned her eye on content and advertising, she found some important trends. Clearly aggregation is growing as pure content creation is slipping further behind. Sites that are able to marry content and commerce are growing, and when you add the meteoric rise of 35% year-on-year mobile 3G subscriber growth you can begin to see where all this ends up. E-commerce now represents 8% of all retail commerce and looks like it will continue to become an even greater percentage of retail sales. The other imbalance, according to Meeker, is that advertising spend is crazy out of whack with where eyeballs are. Print represents 8% of people’s time and 27% of ad spending. Mobile, by contrast, accounts for 8% of people’s time and 0.5% of ad spending. But things in the U.S. aren’t all bad. In fact, when it comes to mobile, things in the U.S. are rocking. Despite the U.S. economy, American companies are leading mobile. American-made smartphone operating systems–Android, iOS, and Windows Mobile–have gone from 5% market share in 2005 to 65% today.